Unfortunately, when you are camping, you are spending the night in the mosquitoes backyard. They will do everything they can to take a sampling of you when you aren’t looking. The good news is that there are plenty of products to repel them and some tactics to take around your campsite to keep them away. We’ve heard of many that people are happy with. Most choose a product like OFF! or use some form of Deet spray. More often, however, we are hearing people voice concerns over the chemicals these products are made from and they seek a more natural approach. For natural products, we have seen people use Avon’s Skin-so-Soft quite successfully. Many of them swear by it and carry it every where. You might also try Beat It! which is a natural insect repellent. It is Deet-free and lasts up to 8 hours. It is advertised as being effective against mosquitoes, ticks, fleas, black flies, no-see-ums, and a host of other biting pests. 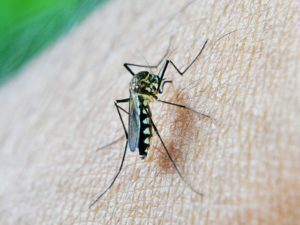 We’ve seen an increase in the use of mosquito repellent bracelets, especially for kids. They do not contain Deet and come with a 100% guarantee and 30 day refund if you are not satisfied. You can wear them for two or three days before changing them or store them back in their resealable pouch when not in use. There are some good old fashioned formulas that people swear by as well. We’ve seen spray bottles of water and peppermint oil, straight white vinegar, or Listerine. Some people tuck Bounce dryer sheets in their collar, cuffs, and socks. We’ve even heard that eating a clove of garlic a day will keep the mosquitoes away. One thing is certain, however, mosquitoes love standing water so check your campsite regularly for water that is lying in small puddles and keep things dry. You can also try not getting to warm. When you get hot you exhale more carbon dioxide which attracts mosquitoes. So wearing light colored clothing will also keep you cool and keep the little buggers away. You can also burn citronella candles around your campsite. Many people believe it helps. We hope you get through your whole camping trip without the mosquitoes even knowing you were here. 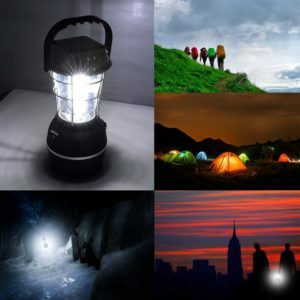 Having reliable, portable lighting is a must when you are camping. It can get quite dark at night and having a light source to guide you when you walk to the campground bathrooms, across the campground to visit friends, or just walk around your own tent and camping gear can keep you from bruised shins or worse. If you don’t want to depend on batteries you can go with a rechargeable solar lantern. There are plenty of designs to choose from and several offer a variety of features such as low energy consumption and USB output for charging your mobile devices. Try to get one with a range of brightness modes as well. You’ll want different brightness depending on whether you are using the lantern inside or out. You may want to look for a lantern that is water resistant and lightweight. Compare reviews of people who’ve purchased and used the lantern to give you an idea of its performance. And some lanterns can be charged not only by solar exposure but also with hand crank, standard plug in , car charger, etc. We hope your camping stay with us is a great experience and we look forward to meeting you. © 2014-2019 Grand View Campground. All Rights Reserved.